Young volcanoes in the Coprates Chasma region of Mars’ enormous Valles Marineris canyon system, as seen by NASA’s Mars Reconnaissance Orbiter. Volcanoes erupted inside Mars' enormous equatorial canyon in the not-too-distant past, a new study suggests. Photos taken by NASA's Mars Reconnaissance Orbiter (MRO) reveal 130 small volcanoes on the eastern floor of the nearly 2,500-mile-long (4,000 kilometers) Valles Marineris, the largest canyon in the solar system, according to the study. "We observed morphological details such as bulging of solidified lava caused by the injection of more-recent lava beneath the hardened crust, as well as characteristic surface patterns identical to lava fields on Earth," lead author Petr Brož, from the Institute of Geophysics of the Czech Academy of Science, said in a statement. "This reinforces our assumption that we are looking at magmatic rock volcanism and not liquid mud." Other details bolster this interpretation, study team members said. For example, the 130 volcanoes appear to cluster along tectonic fault lines, where magma would have a route to the surface. The cones also are very similar morphologically to known lava volcanoes on Mars and Earth, the researchers added. Valles Marineris in the east of Mars’ Tharsis volcanic region. Higher regions are marked red in this topographic map, while yellow and green indicate moderate elevations; the lowest points are shown in blue. Mars has many volcanic features, the most famous of which is Olympus Mons, the largest mountain in the solar system. Olympus Mons is about 16 miles (25 km) high and 375 miles (625 km) wide, meaning it covers about as much ground as the state of Arizona. Olympus Mons and a number of large neighboring volcanoes are found on a plateau called Tharsis. Most known Martian volcanoes lie in Tharsis and another province called Elysium, so discovering more than 100 of them inside Valles Marineris was a surprise, researchers said. "In geological terms, the volcanic cones are very young, just 200 [million] to 400 million years in age," co-author Gregory Michael, of the Freie Universität Berlin in Germany, said in the same statement. 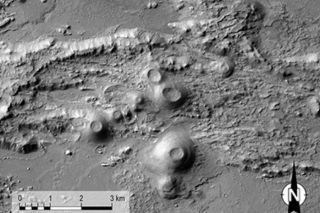 Brož and his colleagues also analyzed MRO spectrometer data about the part of Valles Marineris where the 130 volcanoes lie, a region known as Coprates Chasma. The valleys of Coprates Chasma in the east of Valles Marineris. This perspective view was created using stereo image data from DLR’s High Resolution Stereo Camera on board the European Space Agency’s Mars Express spacecraft. "In doing so, we encountered minerals with high silica content, and even opaline-like substances at one of the peaks," said co-author James Wray, from the Georgia Institute of Technology. Such minerals can form when hot water moves through rock, suggesting that Coprates Chasma may have been a habitable environment in the ancient past, study team members said. For this and several other reasons, the area would be a good site to visit with a future Mars rover, they added. "Here, we could investigate many scientifically important and interesting topics," said co-author Ernst Hauber, from the German Aerospace Center (known by its German acronym, DLR). "Analyzing samples for their elemental isotopic fractions would allow us to determine with far greater precision when the volcanoes were actually active. On the towering, steep walls, the geologic evolution of the Valles Marineris is presented to us almost like a history book — gypsum strata and layers of old, crustal rocks can be observed, as well as indications for liquid water trickling down the slopes even today during the warm season. That is as much Mars geology as you can get!"